Oppo R17 Pro latest chineses smartphone is now available for pre booking on company official website. As per information Oppo R17 Pro smartphone is ready to go for sale from 4 December 2018. Company yet to not reveal the price of this smartphone. Company available for sale of this smartphone on Oppo Indian store along with Amazon.in. It may be assume that company fix the price of this smartphone approx Rs. 40000 for Indian market. This smartphone is pretty good and gives unique premium look with curved display. It is an upcoming single nano sim or hybrid dual sim smartphone. Oppo R17 Pro smartphone is powered by 2.2GHz octa-core (2×2.2GHz + 6×1.7GHz) processor with 8GB RAM, 128GB internal storage which can be expanded. Oppo R17 Pro smartphone priced in India approx Rs. 40000. The Oppo R17 Pro smartphone comes with 6.4 inch FHD display comes with 1080×2340 pixels resolution & Adreno 616 GPU. Oppo R17 Pro dual sim smartphone is running on Android 8.1 oreo operating system. This smartphone comes with 3700mAh non removable Li-Ion battery. If we talk about the camera quality, this smartphone comes 12MP (f/1.5-2.4, 1.4-micron) primary camera and a 20MP (f/2.6) secondary camera on the rear and a 25-megapixel front shooter for selfies. This smartphone comes with Fingerprint sensor, Compass/ Magnetometer, Proximity sensor, Accelerometer, Ambient light sensor and Gyroscope. The dimension of this smartphone measured in 157.6×74.6×7.9mm with 183g weight. 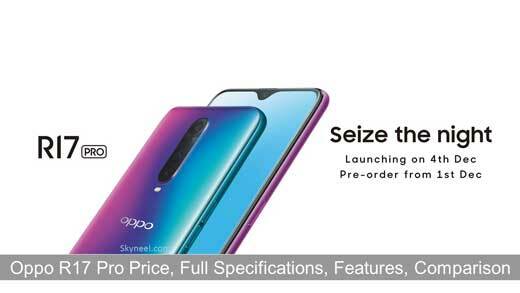 The Oppo R17 Pro comes with Dual-SIM (GSM and GSM) smartphone that accepts Nano-SIM and Nano-SIM. Connectivity options include Wi-Fi, GPS, NFC, USB Type-C, 3G and 4G. You can also get different sensor like Fingerprint, Compass/ Magnetometer, Proximity , Accelerometer, Ambient light sensor and Gyroscope. This smartphone supports Volte/4G/3G/2G on compatible networks. This smartphone is available in two colors, Radiant Mist, and Emerald Green color. You can get 3700mAh removable battery with fast charging feature with the name of, SuperVOOC Flash charge. Processor 2.2GHz octa-core processor, Android 8.1 (Oreo) O.S. with Adreno 616 GPU. Memory Available in 128+8 GB, 8 GB RAM with 128 GB internal storage memory. Display 6.40″ touchscreen display with a resolution of 1080 pixels by 2340 pixels with Android 8.1 Oreo. Dimensions Height:157.6 mm, Width: 74.6 mm, Thickness: 7.9 mm, Weight: 183 g.
Camera Camera, this smartphone comes with 12MP primary camera and a 20MP secondary camera on the rear and a 25MP front shooter for taking selfies. Battery 3700mAh with fast charging. Connectivity Dual SIM (GSM-SIM) which accepts Nano Sim with Wi-Fi, GPS, NFC, USB Type-C, 3G and 4G. Sensors. This smartphone comes with Fingerprint sensor, Compass/ Magnetometer, Proximity sensor, Accelerometer, Ambient light sensor and Gyroscope. Price & Color Priced approx Rs.40000. Color: Radiant Mist, and Emerald Green . This is a premium good looking smartphone, which comes with better camera feature. If you planned to buy better camera quality smartphone then Oppo R17 Pro is better option for you.